Environmentally friendly, purely mineral, non-combustible and easy to handle. Poraver® expanded glass is purely mineral and poses no environmental or health-related risks and is ideal for fills with sustainable characteristics. The spherical granules are very lightweight and yet pressure-resistant. They are free of harmful materials such as VOC or fibres, stable over the long term, can be easily processed and do not offer a breeding ground for pests and mold. Poraver® granules can be used as loose bulk thermal insulation and as cement- or resin-bound fill for pressure loading requirements. The spherical Poraver® has a great pourablity. As dry loose bulk fill it fills beam ceilings and voids particularly easily. This also makes it easy to cover pipes and cable ducts. Facing formwork can also be easily backfilled for vertical interior insulation. 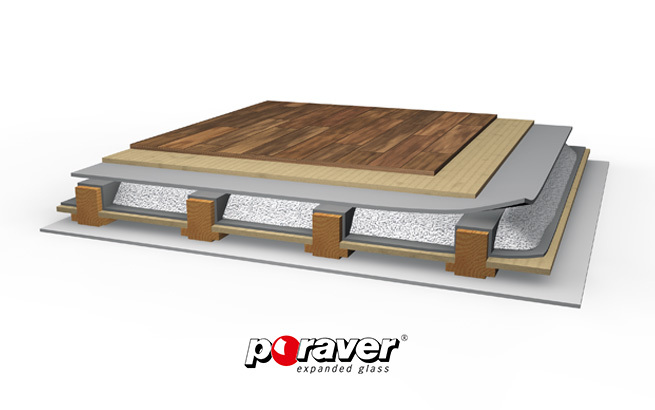 Poraver® has an R-value of 2/inch, does not burn, is moisture-resistant and does not settle. Poraver® cement-bound fills combine structural and thermal performance. It can be used as lightweight screed to adjust the height of floors or as levelling fill over cables and pipelines. Thanks to its low weight and moisture resistance, it can also be used on vaulted and trapezoidal steel ceilings and as a non-combustible pipe duct insulation. The easy handling and quick drying properties reduce man hours spent on the construction project. Resin-bound Poraver® is ideal as a lightweight drainage screed for balconies and rooftop terraces. As a water-permeable, cement-free system, it effectively prevents frost damage and efflorescence and is also ideally suited as thermally insulating slope compensation on flat roofs or as a lightweight marine screed. Because of its very low thermal conductivity, its high grain strength and its resistance to rodents and moisture, Poraver® can be ideally used as an insulation material for heat reservoirs and insulators. The ease of use and the option to be conveyed by air from silos are further advantages.